A few weeks ago, the Spousal Unit and I spent a long, hard weekend casing Vegas casinos for insights into the calculus of probability, as illustrated by (natch!) craps, interspersed with several hours of good old-fashioned poker. Among other things, I learned that "craps" is an apt moniker, and that I can't bluff worth a damn at Texas Hold 'Em. Here is my favorite quote from the craps dealer who gave us a tutorial Saturday morning at the New York New York casino on the basics of the game: "Whatever you do, don't grab all five dice and toss them across the table, then yell 'YAHTZEE!'" Naturally, we were tempted to do just that, but our higher nature prevailed. It all started with an impulse purchase of a series of DVD lectures offered by the Teaching Company: "Calculus Made Clear," with a math professor at the University of Texas, Austin, named Michael Starbird. (He also has a DVD lecture series on probability.) The Spousal Unit noted approvingly that there were actual equations/derivations involved in the lectures, so it wasn't just a lightweight "concept" course. Whatever. The two need not be mutually exclusive; a truly good teacher, like Starbird, will include both. He presented the underlying concepts beautifully, plus he told little historical anecdotes along the way about Buffon's Needle, the Newton/Leibnitz debate, Archimedes, even the famed "Dido's Problem" in the Aeneid. Nothing makes an English major happier than a strong, compelling narrative. Give us a good story, and we'll follow you anywhere -- even into the minefield of solving scary equations. But it soon became obvious that Starbird's textbook "real world" examples were highly idealized versions of what one might find in the real world. They weren't "real" at all! This is a common problem with math and physics textbooks, actually. 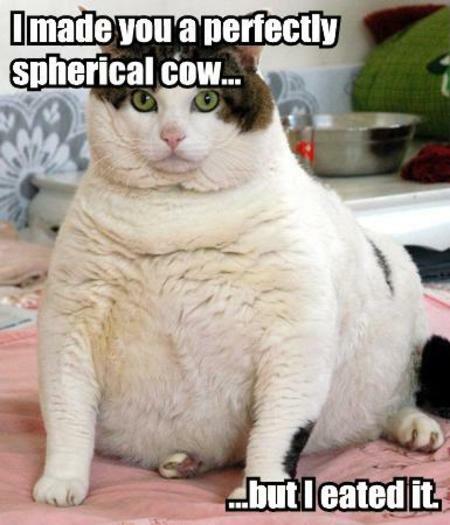 Sciencegeekgirl recently reported on a keynote lecture by Harvard's Eric Mazur at the American Association of Physics Teachers (AAPT) meeting in July, who sharply criticized the tendency of physics professors to rely on "spherical cow" models of reality. His epiphany came when a student in one of his concept courses asked, "How should I answer these questions? According to what you taught me? Or according to the way I usually think about these things?" Mazur's point: "There is something about the way we're teaching physics that is divorcing it, in students' minds, from the stuff of everyday experience." The same is true for calculus. So my approach for the new book is to look around me, pick a situation involving change and motion, then ask, "How can I turn this into a calculus problem?" And then walk myself and the reader through the process of creating our own tailor-made problems. As "Big Daddy" Chad at Uncertain Principles recently observed, while math has its own abstract aesthetics, most of us -- physicists particularly -- use it as a practical tool. The true power of all that abstraction is that the same basic "rules" can be applied across a broad spectrum of problems. The trick is figuring out how to tweak things to fit them to the abstract model. In other words: teach us to think like physicists. It takes a bit longer to learn this way (initially), but it helped me see why the "spherical cow" approach can be useful sometimes -- and where it is limited -- as well as what makes something a calculus problem versus a different kind of math problem. (Craps is an excellent example of the latter: it requires a bit of finessing to turn it into a calculus problem, since technically you're looking at discrete events -- the throwing of dice -- and attempting to treat them continuously.) I highly recommend this approach for math and science teachers. Among other things, kids can tailor problems to stuff they're already interested in. Like gambling. So that's how I found myself at a craps table in a Vegas casino, stomping and cheering with the rest of the marks players when the shooter made a good roll, and slumping my shoulders in disappointed defeat whenever we '"seven'd out." Sure, I'd done some preliminary homework. There's lots of guides to playing craps online, but there's so much jargon, and so many levels to the game, that it's pretty tough to "learn" it with a purely abstract approach -- much like many of the physics explanations on Wikipedia are utterly useless to the novice. Craps doesn't really start to make sense until you get your hands dirty. It just so happens that much of probability theory emerged from attempts to analyze games of chance -- most notably, those involving the throwing of dice, sticks, or bones. Craps derives from an old game called Hazard, supposedly played by English knights during the Crusades -- although alternative sources report the name comes from the Arabic words al zar ("the dice), making the game Arabic in origin. Suffice to say, some version of the game has been around for centuries. There are references in Chaucer's The Canterbury Tales, and it was hugely popular in France in the 17th century. Eventually it wound its way to America and the gambling riverboats along the Mississippi River and developed into the game we know and love today. Anyway, for my purposes, the nice thing about using something relatively simple, like craps, is that the probability aspect is fairly straightforward. There's a manageable number of possible combinations for the total: 36, in fact (6 possibilities for each of the two dice, 6 x 6 = 36). There are more ways to roll a 7 than a 2: to get a 2, you have to roll Snake Eyes (1+1), but to get a 7, you can roll 1+6, 2+5, or 3+4. That's why the casinos chose "7" as the "losing" roll once a game of craps gets underway: it's the most likely number to come up. The possible combinations increase exponentially with the five dice used in, say, Yahtzee. And as Skulls in the Stars pointed out last month, there is an increasing number of "novelty dice" out there (eg, Sicherman Dice and non-transitive dice) with some unusual statistical properties; feel free to read the post for the specifics. We had a nice exchange in the comments, wherein he mentioned that playing Dungeons and Dragons actually taught him a great deal about mathematics, since players have to be pretty adept at calculating the odds of a given throw in their heads. Craps is a beautifully designed game, frankly. Sure, the odds are rigged in the House's favor, but they're not rigged too heavily in that direction. Psychologically, that would be no fun at all. Players need a sense of "reward," even if it's just the illusion of winning once in awhile. I noticed this while playing my first few games. We all would win rolls, sometimes several in a row, but the money we won never quite added up to the money we spent as our minimum bets -- even though I was placing the safest, most risk-averse types of bet. (Cut me some slack. As a beginner, I didn't want to lose all my money right away by blowing it all on one long-odds bet. Oops! There goes the book advance!) The result: at best, you get a slow bleed, but you're less aware of it because the tiny amounts you're "winning" blind you to the long-term hemorrhage. Vegas is notorious for attracting compulsive gamblers convinced they've found the perfect strategy to beat the "system." They are deluding themselves. It only takes the tiniest House advantage to tip the scales irrevocably. You might hit a lucky streak from time to time; if you do, that would be the time to walk away. Play the game long enough, and eventually you will lose everything. Our craps instructor -- whom I dubbed Dominic, because he was so clearly a denizen of Bay Ridge, Brooklyn or (alternatively) Joisey's Pasta Triangle -- was very, very clear about this: "You think you're gonna beat this table? Go right ahead and try. We got ATMs all over the casino, just for people like you." Forewarned = forearmed. There is actually something called "the craps principle" in probability theory, dealing -- as one might expect -- with event probabilities under repeated trials. As noted previously, however, throwing dice -- or analyzing the probabilities involving decks of cards, as in poker -- is more the realm of discrete probability theory, and calculus deals with continuous things. That doesn't mean there's not a calculus problem in there somewhere. My solution -- after consulting with the Spousal Unit -- was to invent an optimization problem: what is the optimal strategy for playing as long as possible with a given starting amount of money? In other words, how can we maximize our fun without breaking the bank in the first five minutes? Then it's just a matter of translating that into the language of math. Here's the big secret I've learned over the last couple of years: calculus really isn't that hard. The information is just presented poorly, littered with too much jargon, much like the online guides to playing craps. Unless you happen to be a "native speaker" of that language, it's just not going to make much sense -- until you get down to the nitty-gritty and start playing the game for real. In fact, one could argue that we all do calculus all the time, without realizing it. A baseball outfielder, for example, has to estimate where the ball is likely to land after the batter gets a hit -- whether he knows it or not, his brain is calculating the trajectory of that ball, then sending a signal telling the outfielder where to place himself in order to make the catch. Lurking somewhere in that process is a calculus problem. Or two. Heck, even lowly worms do calculus, according to a University of Oregon biologist named Shawn Lockery. He's studied roundworms to figure out how they use their sense of taste and small to navigate as they forage for food. He compares the approach to the game of hot-and-cold one might play with a child: you know, saying, "You're getting warmer (or colder)" to help said child hone in on the target. Roundworms do this, too, changing direction in response to feedback, but they get their feedback not from an outside observer, but by calculating (via neurons) how much the strength of different tastes (in this case, salt concentrations) is changing. In other words, the worms take a derivative to figure out how much a given quantity is changing at a given point in space and time. Calculus: it's everywhere. And it's not just for math class anymore. You can run, and you can hide, but sooner or later... we all will derive. I read an article about gambling years ago, and a guy they interviewed had in fact found a way to make a living as a gambler - instead of gambling against the house, he would make bets on the craps game (or any other game) with other bystanders. Essentially, he was his own casino. Crapaud, not crap is frog in French. One of Australia's more notorious science presenters is often asked about gambling maths, and his point is that the key is to minimize the number of bets- preferably to one. So when interviewed on the topic, he advises folks who must gamble to take all the money they're going to spend*, drop it on a roulette wheel, and walk away afterwards regardless of the outcome. *obviously you need to decide this ahead of time. Your Aussie presenter is ignoring the "fun factor." See, it's FUN to shoot craps, so you want to get the most bang for your buck, i.e., lose money slowly over as long a period as possible. If one minute of heart-pounding excitement at the roulette wheel suffices for some people, so be it: place one bet on that. But I think it's a pretty boring game. Jen said: The trick is figuring out how to tweak things to fit them to the abstract model. In other words: teach us to think like physicists. This is an astute observation. I work on changing the way we teach our junior physics majors at the university. One of the things that I've seen, over and over, is the difficulty that these students have in translating what they learned in math class to what we're doing in physics. They take Calculus I, II, and III and can integrate with the best of them. But then they get into this electricity & magnetism class and they no longer have the integrals *given* to them, as in math class. Now they have to look at the physical problem (for instance, a charged ball) and decide *what* they need to integrate over. They have to take the physical situation and figure out how to apply the abstract models that they've learned. It's a real brain twist, and is what makes physics tough, at all levels. I mean, after all, once the equation is set up, many of us can calculate it. But which equation do we use, and what do we plug in for the little symbols? That's the physics of it. Love the working title of the book; especially "the Dangerous Curves" part. I hope your book goes into my school library when it comes out - so I can borrow it! "Your Aussie presenter is ignoring the "fun factor."" Yes, he was a math major. I'd been wondering how that video lecture course was going. Now if only they had one for linear algebra, I'd be all set. In my experience (which is, granted, now a year out of date and becoming more so every day), there are two things about the c-word (conceptual, that is, not calculus). The first is that really teaching and grasping the concepts is quite difficult-- more difficult, as Eric Mazur might attest, than teaching how to play with the equations. And, the second is that most courses billed as "conceptual" are nothing of the sort, but are more "term memorization" types of courses. Sadly, the latter has given the whole notion of "conceptual" courses a bad name. Of course, as you point out, most people don't study math for the pure love of the ideas, they use it a toolbox. So, even if you truly teach the concepts without teaching people how to use it, you're not really doing the subject justice. Then again, I'm not convinced that you really can get the concept of a lot of things in math and science without also having to be able to use it.... "I get the concepts, I just can't do the problems" is something students would say sometimes. Alas, they were wrong about the first part; if they can't do the problems, chances are they don't really get the concepts, they are just able to memorize the definitions. Sad that too often memorizing definitions is seen as getting concepts. So you did your calculus and got a book out of it, too! Win-win. OK, now you just gotta get vector calculus and differential equations down pat and you're ready to start with quantum mechanics. When I was in, say, ninth grade, calculus was this mysterious thing in the here-be-dragons territory just outside the borders of comprehension. I knew, from science history books and such, that it involved taking smaller and smaller pieces of things, like breaking a shape into a zillion little slices to figure out the area of the whole, but as to how the ideas I'd received actually fit together, or how to apply them in any practical way to solve a definite problem, I didn't have a clue. I had to sit down and work through the textbook problems, one after the other, before it all "clicked". Now, integrating or differentiating is a routine action -- what would have been an exam question in AP Calculus is the step from equation 17.22 to equation 17.23 in a physics book. Thinking back over the change gives me a bit of a weird feeling. . . . Excellent post. Throughout my years of learning math at many levels as well as physics, I have always disliked the 'bottom up' approach of teaching a bunch of tools first, with little or no discussion of their application or relevance, before teaching problem solving involving the synthesis of those tools. This method isn't how physics and mathematics evolved as disciplines and isn't how one approaches most science. Rather, one first identifies the problem to be solved and breaks it down as necessary until one is able to solve it, using either existing tools, or creating ones own. Disassembling a problem generally isn't something taught until later in ones learning career, when the act of disassembling is what gives context and validity to 'spherical cow' and 'vacuum world' assumptions, and, thus, removes, or at least explains, the seeming disconnect between real life experience and that studied in physics courses. Likewise, this disassembly can help remove the 'mysticism' surrounding calculus to demonstrate that the seemingly abstract concepts have a solid grounding in day to day existence. A favorite example of my own was an epiphany I had while taking a class on Fourier analysis is that our brains perform Fourier transformations constantly in that everything we see and hear is transposed from a time domain into a frequency domain. We perceive light and sound not as rapid fluctuations in time, but as (relatively) constant signals. We don't see one color as 'faster' than another, just different. Neither do we hear different pitches as faster or slower, but rather higher and lower. This I find fascinating. He explains calculus (and mathematics in general) in a really accessible way. Thani you! I had that t-shirt in college and have been looking for a replacement because of the book. Although the Spousal Unit bought me a fantastic t-shirt to reflect my new change in attitude: "YOU MESS WITH CALCULUS, YOU MESS WITH ME!" Jennifer, Why is it "the calculus" and not "calculus"? You should discuss this in your book. Seriously. All kinds of perfectly normal people (seriously normal!) can discuss calculus just fine, but as soon as the question of who invented it first - Leibniz or Newton - they get all fancy and start dropping "The calculus"'s all over the place. Seriously. Why?